JEDDAH: The Saudi National Security and Risk Prevention Expo opened in the capital city on Sunday at the Riyadh International Convention and Exhibition Center. The event, which is being held for the first time in Saudi Arabia, boasts widespread participation from industry leaders, experts and consultants, as well as top local, regional and international companies specialized in the field of security solutions and risk management, and features several workshops focusing on key issues related to innovation in security, in addition to live interactive demonstrations. The three-day expo held under the patronage of Saudi Interior Minister Prince Abdul Aziz bin Saud bin Naif was inaugurated by Nasser bin Abdul Aziz Al-Dawood, the undersecretary of Interior Ministry. He said the Kingdom’s authorities strive to further develop and boost the security sectors to address current and future challenges. As many as 130 companies from 22 countries are taking part in the event, which focuses on the areas of digital transformation and innovative security solutions for smart cities and other projects envisaged in Saudi Vision 2030. The event also features two forums. The first, titled "The future of Hajj safety and security forum,” delves into what Hajj seasons will require in terms of infrastructure, services and security facilities in order to create opportunities for organizations specializing the fields of security and risk prevention. The second, "Smart Safe Cities Forum,” seeks to boost foreign direct investment in Saudi Arabia and support its objectives with regards to economic diversification. 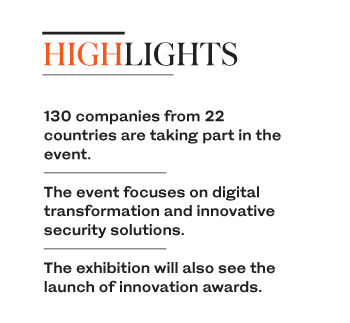 The exhibition will also see the launch of innovation awards which will celebrate innovations across six categories: Virtual and augmented reality, drone detection, unmanned systems and robots, digital crime management and digital forensic clues, connected systems and smart security equipment and crowd control. A panel comprising industry experts will select the nominees and winners from each category. Among the prominent speakers at the event is Mike King from the US, a leading authority on global public security and expert in crime investigation and legal studies, Dr. Faisal Al-Aayyan, vice president of Rabdan Academy in the UAE, Dr. Yehya Al-Marzouqi, executive director for strategy at Tawazun, and Franck Martin, safety expert at French firm ADP-I. One of the many activities taking place at the event is the Smart and Safe City Control Center, an innovative platform to showcase the latest security technologies that will present the first simulation of its kind in Saudi Arabia for emergency response, including equipment especially designed for this purpose, as well as advanced solutions for monitoring and command centers.